Sworn in 1811 as Constable under the newly formed NSW Police set up by Governor Macquarie. Served at Liverpool 1822-1828 becoming Chief Constable in 1826. Believed to have resigned in 1828 to become the first Post Master at Liverpool Post Office. Frederick is believed to be the “third” Chief Constable of Liverpool until 1833. He arrived on the First Fleet on the Scarborough. His grave is at Liverpool Cemetery. In 1811 Frederick joined Governor Macquarie’s police force. He was later appointed the first constable, then the “third” chief constable of Liverpool. He remained in the police until 1833, holding positions of Constable, Chief Constable & District Constable. 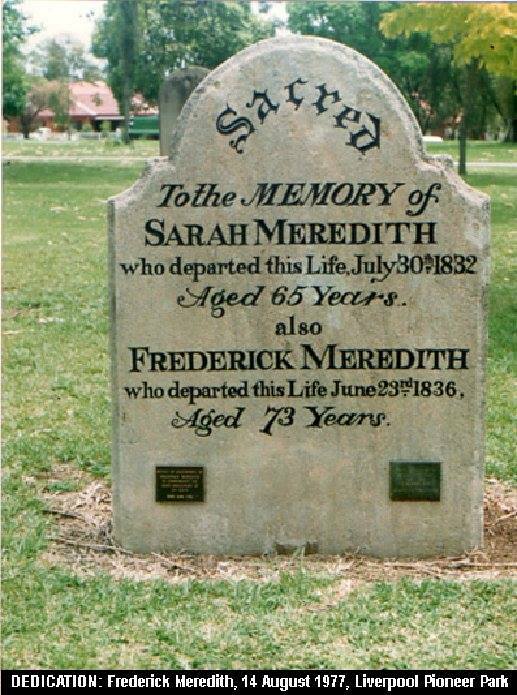 On Thursday, June 23, at his farm Banks Town, Mr. Fredrick Meredith, aged 72 years, greatly respected. Mr. Meredith arrived here as a sailor, in the first fleet, and had long been a resident on the Liverpool Road.